BREAKFAST WITH A ROCK & ROLL ATTITUDE! Download our menu as an Adobe PDF. At the Blue Moon Cafe we only use the freshest ingredients. Due to availability and cost some items may not be available or increase in brice slightly during the year. Homemade biscuit topped with eggs, bacon, Cheddar cheese and smothered with sausage gravy. Served with has browns. Chorizo, peppers, onions, tomatoes and eggs, Highly seasons and topped with cheddar cheese. Two corn Tortillas covered with chorizo two eggs (any style) spicy ranchero sauce and cheddar cheese. Two Flour Tortillas with hash browns scrambled eggs and sausage gravy. Broccoli, Mushrooms, Onions, Peppers and eggs topped with Cheddar Cheese. Served with hash browns and toast or biscuit. Three eggs, ham, green peppers onions and hash browns. Served with toast or biscuit. Broccoli, mushrooms, onions, hash browns and three eggs scrambled together and topped with melted cheddar. Seasoned with Bacon, onions and peppers. Served with applesauce and sour cream. Three eggs, homemade salsa hash browns and cheddar cheese stuffed in two flour tortillas topped with more cheese and salsa. Spicy Mexican Sausage scrambled with three eggs served with hash browns and a flour tortilla. Plain potato pancakes smothered with fresh sauteed vegetables and cheddar cheese. Diced ham, sausage, bacon, broccoli, mushrooms, onions, peppers, tomatoes, mozzarella, and cheddar cheese. Two Pancakes or French Toast Two eggs and sausage or bacon. Two homemade biscuits smothers in real country sausage gravy. All benedicts are made on a toasted English muffin with two poached eggs, tangy hollandaise sauce and served with hash browns. Sauteed broccoli, mushrooms, onions, peppers and tomatoes. Lots of delicate Maryland Lump crab meat. Melted cheddar, fresh roman tomatoes and lump crab meat. Crispy Bacon & lump crab meat. Our Omelettes are made with three eggs and served with out famous hash browns and toast or homemade biscuit. Mozzarella, pepper jack, and cheddar cheese. Diced ham and lots of cheddar cheese. Diced ham, green peppers, onions. Diced ham, green peppers, onions and cheddar cheese. Broccoli, mushrooms, onions, green and red peppers, tomatoes, cheddar cheese and mozzarella cheese. Chorizo, onions, peppers, tomatoes, highly seasoned with spicy Spanish herbs and topped with cheddar cheese. Sausage, tomatoes, mushrooms, onions and peppers seasoned with zesty Italian herbs and topped with Mozzarella cheese. Sausage and cheddar cheese smothered with sausage gravy. All of our sandwiches are served on homemade bread, with cheese hash browns or fresh fruit. Served with hash browns and toast or biscuits. Owner of The Blue Moon Cafe, Sarah Simington is a true force to be recognized both in the kitchen, and in every day life. Sarah's efforts to give back is evident, and she's determined to connect to others while sharing her true passion for life, love and comfort food. Even more so after she had been selected in April of 2011 to represent the America's Chefs program. Thanks to the support of America's Chefs, Sarah is able bring her rock and roll food experience to the US Troops on a culinary entertainment tour with the US Navy in the Mediterranean. With Food Network Chefs like Guy Fieri, Tyler Florence, Hodad, & Stretch, supporting the program, Sarah just had to give this tour a healthy dose of Baltimore, along with her Blue Moon Cafe spirit. 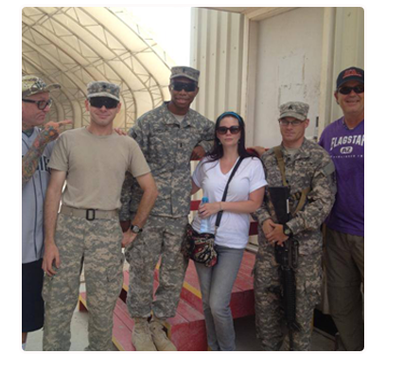 Sarah began this mission in May of 2011 when she shipped off for her first America's Chefs Tour, visiting various Military bases around Europe. Be sure to keep checking back to see what travel adventure is next for Sarah, and The Blue Moon Cafe! 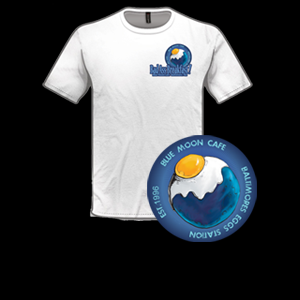 Blue Moon Cafe merchandise available on location.